MIDDLETOWN - Setting goals isn’t anything new for Southington’s Tyler Heidgerd. And this season, neither has been reaching them for the sophomore swimmer. 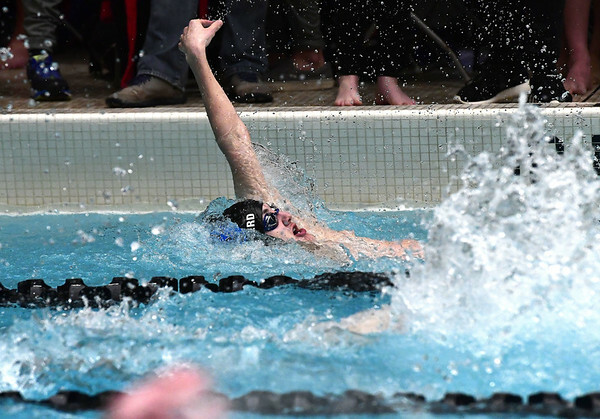 So it is no surprise Heidgerd has saved his best performances for when they count the most and was one of the Blue Knights swimmers to qualify for the Class LL finals meet in two events after a strong showing in trials. Earlier this season, Heidgerd set a goal for himself for the 100 backstroke - to go 55 low. During trials, he reached that goal and hit the touchpad at 54.64. And although, he went into finals as the sixth seed in that event, that wasn’t enough for Heidgerd. He did just that on Wednesday. During the Class LL finals meet, Heidgerd placed third in the 100 backstroke, touching the wall at 53.90, while dropping .74 of a second, and having splits of 26.33 and 27.57. In the 200 freestyle, Heidgerd’s other event, he finished in 13th place with a time of 1:49.32, dropping .25 of a second and had splits of 51.81 and 57.51. He had finished 14th at the Class LL trials with a time of 1:49.57 and was seeded 14th before finals began. Heidgerd was also a member of the Blue Knights 400 freestyle relay team and helped the group - consisting of Brian Egan, Derek Melanson, Quint Kimmel and Heidgerd - drop 8.09 seconds of its qualifying time to take 10th place with a time of 3:21.93. Heidgerd had a split time of 48.93. The relay had reached the finals with a time of 3:30.11. Heidgerd times, Tuttle said comes from what the young swimmer is able to do in the offseason. Heidgerd has been swimming for eight years now and before the season comes to a close, he will have to compete in one more meet - State Opens. Posted in New Britain Herald, Southington on Wednesday, 14 March 2018 20:56. Updated: Wednesday, 14 March 2018 21:15.